A Centre of aesthetic at the forefront of technology medicine discover our services online. Consultation online or 0325082790 Rapid response in less than 48 hours by mail. The new “Follicular Unit Extraction” FUE technique is less invasive than the traditional technique of the Strip. Without scalpel or visible scar, the FUE uses no scalpel, and is without scar in the sampling zone. The FUE is automated for fast sampling while allowing an optimization of the quality of the grafts. Punch size does not exceed 0.9 mm in the past there is a risk of having something “end” of the donor area. 2 mm punch (or maxi graft 3D) should be avoided and leave indelible scars. 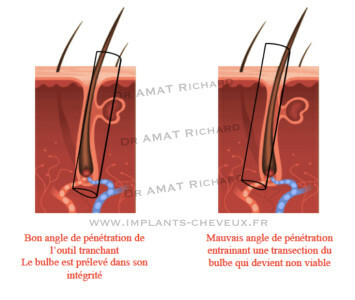 Dr. AMAT uses since 2010 this FUE technique only. This technique is used for the removal of the graft (follicular unit), each UF provides 1 to 5 hair. 500 grafts transplantation corresponds to 1000 hair on average. Information to address temporal gulfs to average 1000 grafts (550 grafts per side). The objective of this technique is to obtain a more natural look possible. The causes of hair loss are many, but the lead is determined at birth, heredity in the genetic heritage of each or each. 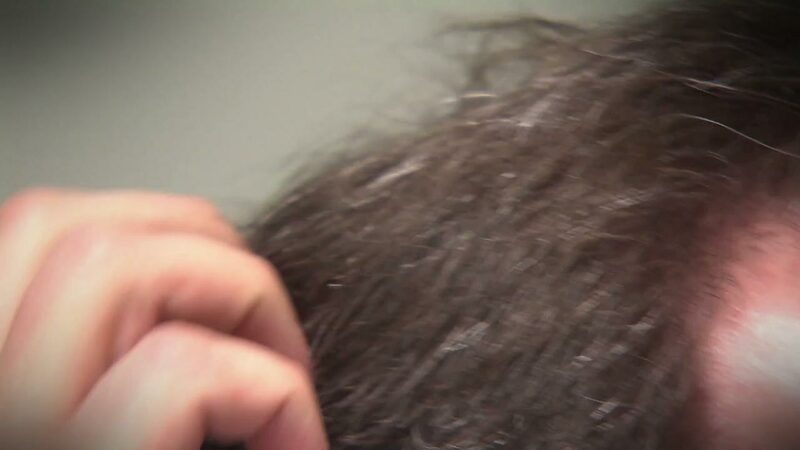 Under the influence of male hormones (androgens including testosterone), the male hormone-sensitive hair miniaturised gradually, one speaks then of androgenic alopecia. Baldness is frequent and affects both men and women. 20% of men from 20 to 30 years and 50% of men at age 50 are affected by baldness. It is normal to lose her hair, but dropping more than 50-100 hairs per day is not normal. What technique to choose? FUE or was? The two main techniques of hair implants are the F.U.T. 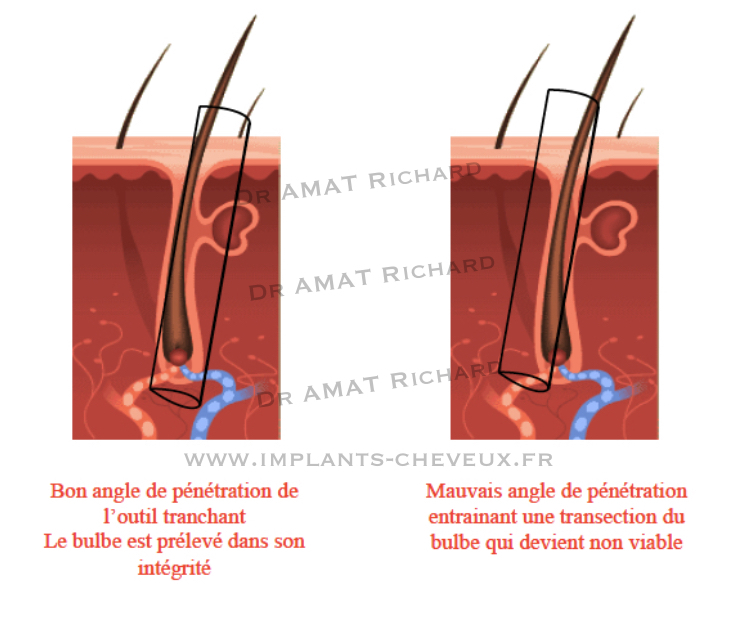 strip technique (Follicular Unit Transection), and more recently the technique F.U.E. (Follicular Unit Extraction). These two techniques are very different both in the collection and implantation. The Strip uses cut a strip of scalp in the Crown area and then a suture is performed. Necessarily leaving a scar on the back of the skull, the Strip is suitable for very important baldness patients possessing a laxity of scalp. The strip of scalp is then trimmed manually with a razor blade to get the plugins of various sizes and relocated manually. There are several variations in technique F.U.E. manual or automated. The technique F.U.E. traditional is very operator dependent. In fact to use less than one millimeter in diameter tools to extract a follicular units requires great dexterity failing however completely the risk of what is called a Transection (the bulb is in part or totally damaged during collection and hair regrowth not once implanted in the donor area). Shaving of the donor to take area, anesthesia local. Follicular units are removed one by one with a punch edge 0.8 mm so no scar is visible. A punch is a small sharp on board extra drill that will turn very quickly and allows the suction of the follicular unit. The UF are patiently relocated to the level of the bald areas. 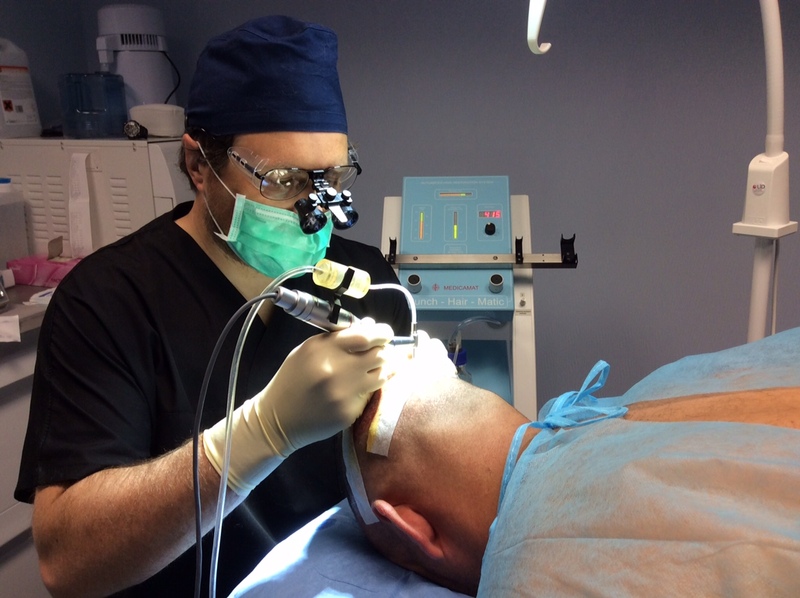 Real alternative to hair transplant, new biofibres allow a capillary densification without surgery with an excellent aesthetic result and very good in time.